They write: “Stark Sisters Granola, which has received rave reviews for its Maple Almond, Nutty Maple and Maple Raspberry Blueberry from Bon Appetit, The New York Times, Boston Globe, and many more, is now proud to say that all their granolas have been Non-GMO Project Verified. This Verification demonstrates Stark Sisters’ fierce commitment to keeping Genetically Modified Organisms (GMOs) out of our food. 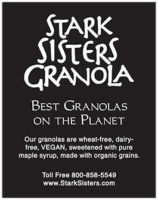 Stark Sisters Granolas are also wheat free, terrific, crunchy, vegan, kosher and made with organic grains. David Rosengarten said about Stark Sisters Maple Almond, Nutty Maple and Maple Raspberry Blueberry, “This is the stuff…tastes really fresh, and natural as if you’re Euell Gibbons on a foraging expedition….” For more information, send Debra Stark an email at [email protected] Call 800-858-5549. Percentage of the brand’s product line that is certified organic. Percentage of the parent company’s products that are certified organic. Brand’s commitment to ensuring all cereals are non-GMO. Parent company’s commitment to ensuring all of its products are non-GMO. Brand’s commitment to ensuring that hexane is not present in its cereal and granola products. Brand’s commitment to ensuring that harmful synthetic agrichemicals where not used in the production of their cereal and granola products. Parent company’s commitment to ensuring that harmful synthetic agrichemicals where not used in the production of any of their products.